Here is my current paint concoction (or however you spell that) being worked on at the new art studio. I haven’t been there much because of getting the kids ready to go back to school and all but I am inching along. Unfortunately, I have been told that I will be needing surgery ASAP for the numbness in my right arm. Yes, irony strikes once again…I am fortunate enough to have this wonderful art studio to work in and my drawing arm goes numb. Unbelievable huh? I can only draw and paint in tiny spurts right now because of the numbness and pain and the doctor says the nerve damage will be irreversible if I don’t get the surgery quickly. 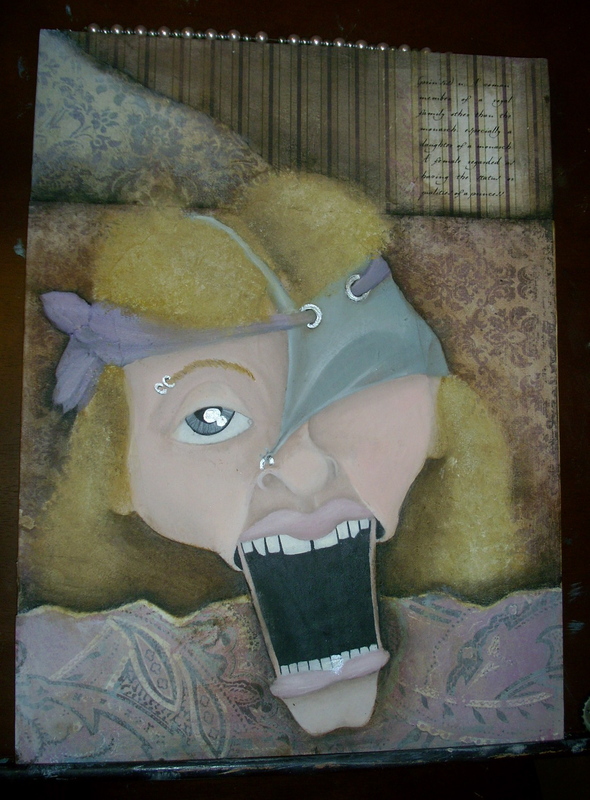 So alas, I must go under the knife if I am to continue drawing and painting. I have also been told that it is not 100% that the surgery will fix me so please cross your fingers, pray, or dance naked under the full moon for me…whatever it is you do to bring about results. I really need all the help I can get on this one. I will keep you in the loop on when the surgery is to happen and will soon put up my ‘studio hours’ so that you can come visit me and my characters in the works. Previous Post My art studio has been born!! !